Home > Musical Notes > Freebie Friday: Michael Franti and Spearhead STAY HUMAN Tour at the Rialto! 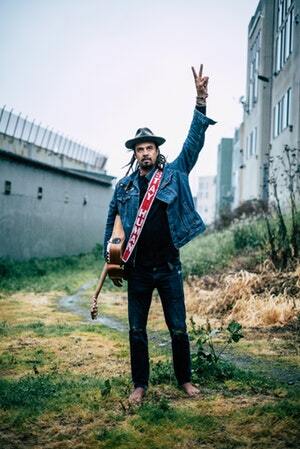 Michael Franti’s much-anticipated STAY HUMAN TOUR is making its way to Tucson on Friday, June 8th. Heads up, because tickets are selling out fast! We know that you’re excited to see Michael Franti and Spearhead hit the stage, and so are we! We even wrote a whole blog about why you should see this outstanding performer live. The Rialto Theatre has generously given Bookmans a pair of Michael Franti and Spearhead tickets to give to one very lucky customer for #FreebieFriday! Anyone familiar with Franti’s work knows that he is a die-hard humanitarian. In fact, a $1 from every ticket sold is going directly toward “Do It For The Love,” a non-profit that gives those with life-threatening illnesses, wounded veterans, and children with disabilities the chance to attend a live concert (for more information: www.doitforthelove.org). Franti is also a filmmaker, and his full-length documentary Stay Human, which features songs from the new album, is hitting the International film festival circuit in 2018. For more information about the documentary, visit www.michaelfranti.com! It’s easy to enter to win two tickets to see Michael Franti live at the Rialto on June 8, 2018! All you have to do tell us how music heals your soul and makes your world better in the comments below! Share the love with your friends! We will choose a winner via random.org on Monday, May 21, 2018. One comment per entrant will be added to the contest. Comments do not immediately go live but require approval. There is no need to post more than once. Music in general has always helped me deal with my emotions in a healthy way, but Michael Franti and Spearhead holds a special place in my heart for helping me get through some really bad home sickness in college. My brother said he always thought of me whenever he heard them on the radio, which made me think of my brother every time I heard them on the radio. It’s a small thing, but it kept me going. The joy in music is that no matter how you’re feeling, there is music that can help you through it, help you get over it or help you wallow in it. And all of those emotions are valid. Music can understand you in a way family or friends can’t. Or at least it can feel that way. But the music is always there and is what you need. Michael Franti makes friggin magic. I have been a Dave Matthew’s Band fan for 11 years and I started traveling to other cities to see them play in 2007. Music has always been my way to heal from sadness and celebrate happiness. Music is always there. But through DMB and music, I have a large family of friends all I’ve tthe country, and even in Canada. We celebrate marriages, babies, and many other random occasions together. We will be a part of each other’s lives forever. We all have one thing in common and that’s the love of music. Music becomes person,time, and place to me. This song reminds of Dad, that album is what I sang on that long ride home, that artist reminds me of my life in Texas…Music keeps my memories close at hand. And the BEST MUSIC is dancing and singing music ‘cuz its music you can share and sharing makes the world go ‘round! I love listening to Michael franti and spearhead. The first time I heard them was last year at the oro valley music festival. I have been hooked ever since. When I listen I can’t help but dance to the music. It is so upbeat and positive. Each song has a great message that warms my heart and gets me singing even on a bad day! The sound of sunshine coming down..is music to my ears! Another favorite of mine is once a day. Everybody outta hug somebody at least once a day! We all will rise up! The sounds of Michael franti uplifts my heart and spirits. I often put it on at work. Everyone that hears it gets hooked! Spread the love, spread the music, hey now now! I first saw Michael Franti and Spearhead at the Oro Valley music festival and I was instantly hooked. When I listen to Michael Franti and Spearhead I can’t help but dance and sing along. The music is so uplifting and every song has a positive message. One of my favorites is “Once a Day”. I play Michael Frani and Spearhead at work. Everyone who hears it asks me who it is. They also can’t help but sway to the music. Everybody outta hug somebody at least once a day! Share the love share the music. Hey Now Now. Music heals my soul in so many different ways. When I am Japan’s energized it moves along with that mood. When I am in a sad state, music can be there with me and relate or help make me whole again. I would love to take my kiddos to see Franti! Music is the most Universal language there is. It evokes emotion, triggers memories and helps create new ones. It can lift your spirits and sometimes bring you to tears. Music is the sound of the soul. Music is a pure form of communication. It can convey the entire range of human emotion so that the message can be received in all languages! I personally use music most often to lift me up or get past bad feelings. When that situation, whatever it is, puts you in a foul mood. Music it what gets me past and moving on. Michael Franti is one of those humans on that music list!!!!! We love all music but the first time I saw Michael Franti it definitely made an impact. So relatable and fun. I just love his music and causes. Music is a treat that I put off for later when my chores are done. I know you are supposed to listen to music when you are doing other things, but I am bad at multitasking. In 2013 I was scheduled for surgery, my first. Im a nurse and as the time approached my gut kept telling something was going to go wrong. I ignored my nurse gut! I would never do that if it was one of my own patients! I’m alive came out on the radio about a week before my surgery and I listened to it multiple times everyday right up to my surgery. During my surgery I went into complete cardiac arrest. The surgery was stopped. I freaked the whole crew out when I told them I knew, even before I had come out of anaesthesia. Needless to say when I got home I decided to watch the video for I’m Alive! So grateful to be alive! Imagine my complete awe at seeing all the anatomical hearts flashing through out the video!!!! Music IS life!!! Music helps the spirit soar! For some music is something that is served on special occasions. For me music is a piece of my everyday. The melodies, the rhythms like a good book transport me to another place in time or help me deal with the realities of the day. Michael Franti’s music empowered me when my sister was fighting cancer. I would blast his music on my way to work and felt ready to face the day. This iis the majesty of music. So pure so true! Music is medicine. Live music intensifies that effect for my family. Forget water, Music is life!! Music has been a huge part of my life since I was in preschool, when my mom bought me my own record player! I wore that thing out with my little 45s and as I got older I would do extra chores to make money to buy new ones at the drugstore. Music has been my best friend my whole life. It’s always with me no matter what’s going on in my world or what kind of mood I’m in…whether I’m rocking to bands like Nonpoint and A Perfect Circle, kicking back with Michael Franti and Ziggy, or reminiscing on times with family and friends throughout my life to nearly every genre—I’ve been blessed to have many musicians as friends and many friends who love music, and I would be ecstatic to see Michael Franti live! His music always puts a smile on my face, love in my heart, and makes life better! Being a nurse for 30 years has taught me to share music. Music calms those in pain, distracts and reassures those that are scared and lonely. It heals the soul and soothes the spirit. It also strengthens the nurse to balance their energies to help others. Not just at the bedside. As a home care nurse, I also need soothing and balance between patient visits. If one visit is boisterous, but the next needs to be calm and quiet, music in the car between visits helps switch gears. If one visit was sad, with life culminating, I need catharsis. A sad song can release the tears and wash away the strong emotion. To start again at the next visit. Being a DJ at a local radio station, allows me to share my musical travels and moods with others! Volunteer work allows me to give and love unconditionally, sharing with a caring community. Michael Franti rocks every house he comes to and teaches us responsibility to the earth and our fellow humans. Music opens my heart and makes my spirit soar. When I am listening to music I feel like dancing with my arms and heart open. Nothing brings us closer to the feeling of being alive. I have always loved music. I love the way I can always find music to relate to what I’m going through at any given time. I was diagnosed with systemic lupus erythematosus in 2002 and have been getting sicker every year. It’s a constant batter between fatigue and debilitating pain but I get through each day. When I’m having an especially bad day I will listen to songs that will motivate me and it does the trick. Listening to my moms favorite songs helped me get through her death in 2014. Music is what I use to get through life. I was 14 the first time I ever heard Fleetwood Mac “dreams”. I was with friends that I thought would last forever, it was a muggy monsoony evening in Tucson. The lyrics were haunting, ethereal and beautiful. I was so deeply and profoundly touched by that moment, and I remember it to this day as though it were yesterday. That is the moment that I fell in love with music. Though those friends have long since decided to “go their own way”, music has stayed. Although I listen to music all day every day, I try to take an hour or so every Sunday to listen to songs that speak to my heart, and I call it “Sunday night music”. It gives me a few minutes to be peaceful and reflective on the joy of life and how much of that joy has a soundtrack of beautiful music. Though Sunday night music almost always includes Fleetwood, it doesn’t have to. Sometimes it can be some soothing deep house, maybe some Erik Satie piano solo, Kaleo, Michael Franti, rebelution…. it has nothing to do with the genre and everything to do with the feeling.